In the late 90's I worked with Swedish Institute for Disability, we were doing R&D about Maps for people who are either blind or a big disability seeing. Last week at an event the last session was about how IT made life more accessible for people who are blind. I was not surprised I met a blind programmer. Back in the 90's we were doing C++, nowadays it is C#. After that session I started to think that maybe many of our challenges at that time would be more easy to overcome now or even not a problem. A major challenge at that time was just access to GIS data. Today it is not a problem. At that time text to speech was also a problem and really a new thing, at least on the consumer market. Today, there are several on Windows Store for free. I have made some Googling, and Binging and I found some ambitious initiatives regarding the subject. But some were even not working and were build on outdated libraries. So I decided to do something by combining the thoughts we had from that late 90's and common widespread technology. And guess what. Things that took weeks or months took me just a couple of hours. Most of the time thinking, maybe this is not relevant. But I decided to publish this anyway. The search field as made for searching. 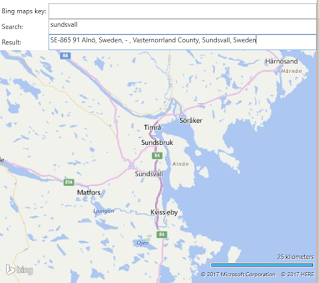 The result field is made for display search result WHEN the user clicked on the map. When the user clicks on the map there is a reverse geo-coding made in the background. The result is displayed in the text field so it should be possible to use the speech to text. When the user moves the mouse it will give a sound signaling the user how close to center of the map she is. The brighter sound the closer to the center. Combing sound, reverse geo-coding and searching I hope this might useful. I also started to think that vendors should also provide semantic about the imaginary the deliver. It would be interesting to request metadata over a view as when requesting itinerary. Here is the code. 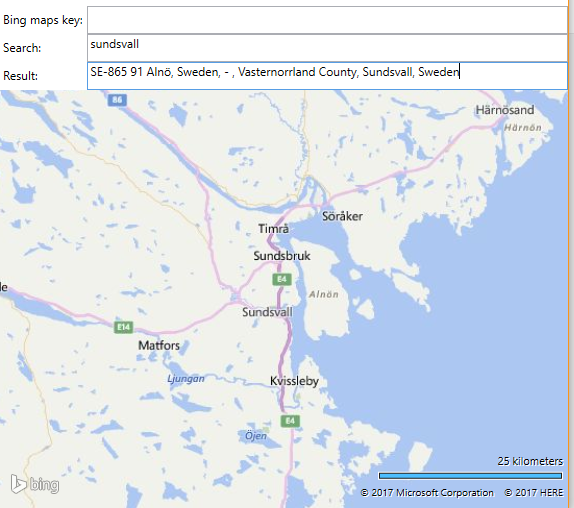 You need to provide your own Bing Maps key. You can get one from the portal.